In theory, Ferdinand, as Kaiser, had at his beck and call a Reichsarmee but this concept was not worth the paper on which it was written. The German princes who made up the patchwork of the Holy Roman Empire had long had local forces to support their own interests but the ‘right’ of the Kaiser to require the supply of a contingent was a frequent source of contention. The circumstances of the Reformation forced the Kaiser to appoint two Field Commanders, one Catholic and one Protestant. Such contradictions did not make any easier the so-called Simplum whereby a minimum of 40,000 soldiers were in theory available to the Emperor. Other difficulties arose from the fact that the local nobility and the Church were reluctant to part with their staff and workers who contributed so much to the upkeep of their estates. As a result, the Landesaufgebot (contingent) rarely materialised. Thus the Kaiser was really only able to establish his own army if he was prepared to finance it exclusively himself. But such an army required logistics and money, both of which were lacking as Ferdinand II at the beginning of his reign found himself confronted with a vast conflict. Unsurprisingly he panicked and called for international support, thus helping transform a local dispute into a full-scale European war. The presence of the ‘usurper’ Frederick of the Palatinate and his English wife, Elizabeth, daughter of James I of England (the Winter Queen, as she became known) on the throne of Bohemia further widened the conflict. Frederick’s father-in-law sent two British regiments to support him though they never ventured beyond Berlin where they became, fortunately for Ferdinand, ‘horribly drunk’. As these forces gathered against him, the absence of the essentials of war put the Habsburg in a precarious position. He had either to remain a dependant of the Catholic League, whose leader the King of Bavaria was a Wittelsbach and therefore also potentially a rival of the Habsburg family, or he had to make peace somehow with the rebels. Or there was a third way: he could find a warlord prepared to organise his war effort in return for Imperial ‘favour’. In Alfred Eusebius Wallenstein (1583–1634), who was raised to the rank of Duke of Friedland in 1625, Ferdinand was fortunate to find a man who was prepared to build an army for the Emperor from entirely private funds. Wallenstein, the scion of a cadet branch of the Waldstein family, had fought against the Turks and had converted to Catholicism under Jesuit instruction. Marrying a wealthy widow with impeccable connections he had defected to the Imperial cause in 1619, shortly after Dampierre’s cuirassiers had saved Ferdinand in Vienna. Through the Jesuits, Wallenstein came to be trusted by the Archduke. The first encounter between this inscrutable monarch and the blunt warlord cannot have been easy for either party. Wallenstein had a reputation for violence: he had flogged half to death one of his servants when he was a student. Ferdinand, on the other hand had learnt from the events of June 1619 that in an age of violence he was defenceless without troops. Might Wallenstein be the answer to his prayers? This ‘soldier under Saturn’, as a later biographer called him, as well as being the greatest commander of his age also offered the Habsburgs a way of making war which was truly new, relying on artillery and cavalry to an unprecedented extent. Discipline and leadership were organised along strict lines of command indifferent to the religious controversies of the time. In return Wallenstein sought not money, for Ferdinand’s treasury was empty, but the one thing the Habsburg had in abundance, thanks to the turmoil in Bohemia: land and titles. As the conflict in Bohemia progressed through the 1620s it provided a once in a lifetime opportunity for a radical reorganisation of wealth and a comprehensive redrawing of the aristocracy. The revolt of the Bohemian nobles brought the House of Habsburg the power of redistribution on a vast and hitherto unprecedented scale. It is estimated that some 670 estates changed hands as vast tracts of Bohemian territory were stripped from the rebels and given to 200 adventurers and officers prepared to embrace the Catholic faith. These included such men as the Friulan Collalto and Strassoldo, the Italian Gallas, Colloredo, Montecuccoli and Piccolomini (who received respectively Reichenberg, Nachod and Opočno) as well as such Celtic miscreants as Leslie and Butler (Neustadt and Hirschberg). None benefited more from this unique redistribution than Wallenstein himself, who set about erecting at the heart of Europe, along the strategically vital Bohemian and Saxon frontier, a territory which would furnish him not only with prestige but with the wealth in agriculture and minerals needed to sustain a vast army. No costs were to be incurred by the Imperial house. All Wallenstein sought was the required charter of authority and the freedom to choose his officers and recruitment depots. The charter was quickly granted by Ferdinand, who also gave Wallenstein the impressive designation of ‘General-Colonel-Field-Captain of the Imperial Armada’. Armed with this title and his logistical genius, Wallenstein set about granting recruitment patents to various warlords and landowners who pledged to equip and dress their ‘regiments’, whereupon they would be assembled for the Kaiser’s strategic wishes. At this point the Kaiser undertook to pay the soldiers. But even when the Kaiser failed to pay, Wallenstein, supported by a network of financiers, raised the vast sums necessary to create the conditions which enabled him to be the closest Europe north of the Alps had ever seen to the ‘Condottiere’ warlords of the early Renaissance. Throughout the 1620s, Wallenstein’s financial architecture kept the bankers of Europe in business. With money came a new organisation. Each regiment had its Obristen or colonels, each of whom was assigned an area for recruitment. The local civilian administration was ordered by the Emperor to support the recruitment as best they could. Once the recruits had received their ‘hand-money’ they were no longer under civilian law but governed by the rules of war. This system proved most effective but it led invariably to abuses. The financing of the system through the 1620s commercialised every aspect of the art of war. Equipment and soldiers became commodities to be speculated with by consortia of usually canny civilian tradesmen who well knew that the colonels had an interest in keeping their numbers of recruits as high as possible. Perhaps this explains why some accounts have tended to set the size of the armies at about 35 per cent above the actual figure. The feats of logistics hinted at here could not have been achieved without the help of the tax system, which fell with remarkable consistency through the 1620s on the crown lands of the House of Habsburg. For example, Upper Austria needed to pay 53,000 gulden (in modern values $53 million, at a rate of 10 gulden = $1,000). Silesia needed to finance the equipment for 28 regiments while in Lower Austria a poll tax was levied which cost every landowner 40, every priest 4, every doctor 30 and every craftsman 6 gulden. Even servants contributed, though only15 kreutzer (100 kr. = 1 gulden). In this way a regiment of foot soldiers cost about 260,000 gulden a year while a regiment of cavalry was 450,000 gulden a year, each regiment consisting of between 1,200 and 2,000 men. Each foot soldier cost the Kaiser 8 gulden while each cavalry-man cost a staggering 20 Reichthaler ($20,000: 10 gulden = 1 Reichthaler). These costs were of course dwarfed by that of the new technology: artillery. Twelve guns and their crews cost at least 600,000 gulden a year. Wages reflected rank but were modest. The Colonel received 185 gulden, his Lieutenant-Colonel 80 and so on down to the ordinary foot soldier who received 3.5 Reichthaler a year. According to a document dated 1623 from Znaim (Znojmo) each foot soldier received 2 pounds of bread, one pound of meat, 2 pints of beer or one pint of wine each day. A cavalry captain by contrast was entitled to 20 pounds of bread and 12 pounds of meat, two hens, half a sheep or cow, 8 pints of wine and 12 pints of beer (!). These ‘rations’ of 1623 contain the concluding sentence signed by Field Marshal Tilly that troops ‘requiring more than this should pay for supplies out of their own money’. Count Jean Tserclaes Tilly (1559–1632) was another outstanding product of Jesuit training. First seeing service in Spain, the Walloon learnt the art of war from the age of 15, serving under the Duke of Parma in his war against the Dutch. In 1610, he was appointed commander of the forces of the Catholic League, established in 1609 as a loose alliance of Catholic principalities and minor states. 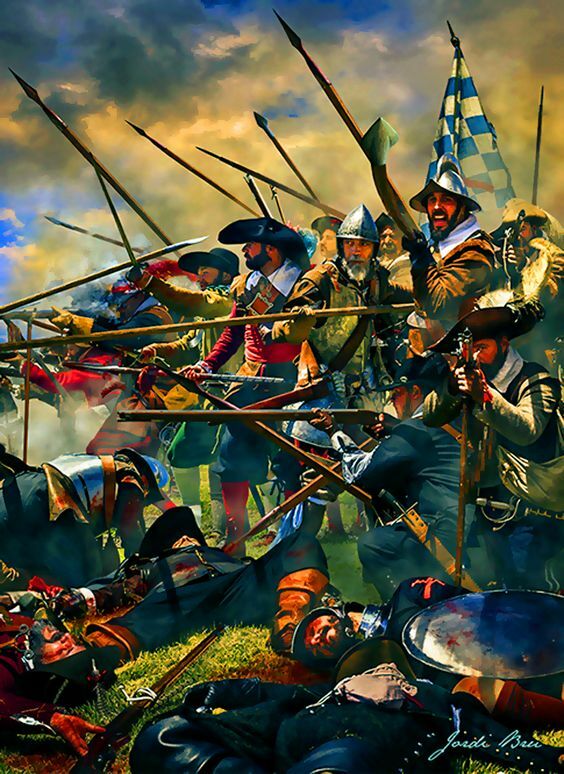 Like Wallenstein, Tilly brought in important reforms, especially from his experience of the formidable Spanish infantry. Nicknamed the ‘monk of war’, he soon proved to be a highly capable organiser of infantry tactics, which were quickly adopted by Ferdinand’s troops. The infantry at this stage still consisted of pikemen and musketeers. The pikemen wore armour and carried a pike, which at that time was between 15 and 18 feet long, made of ash with a sharp metal point. Their officers carried shorter pikes with coloured ribbons. The musketeers were a kind of light infantry with a light metal helmet, later replaced by a felt hat. The heavy musket they carried needed to be rested on a wooden pole with an iron fork to be fired. The ‘ammunition’ was contained variously in a bandolier, a flask of gunpowder and a brass bottle of combustible material, the so-called Zundkraut as well as a leather bag containing small metal balls. A small bottle of oil was also carried to ensure that the ‘alchemy’ required to fire the weapon functioned smoothly. This was far from straightforward. A hint of the complexity of firing this primitive musket is given by the fact that ninety-nine separate commands were needed to fire and reload the weapon. A further forty-one commands existed for dealing with the musket at other times. 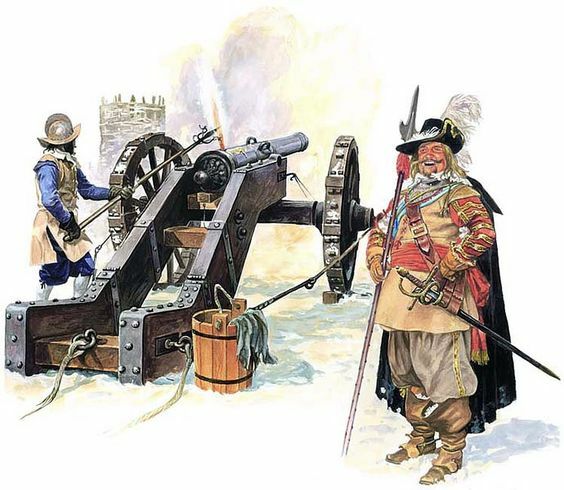 As this suggests, the need to increase the rate of fire and simplify the munitions were priorities for all commanders throughout the Thirty Years War. These problems would only be solved with the advent of the Swedes, who entered the fray against the Habsburg in 1630. They had a modern solution to many of these problems: the introduction of small cartridges wrapped in paper. The only tactical unit at this time was the company, which was deployed in a large square made up usually of between 15 and 20 companies. This formation was 50 men deep with its flanks protected by 10 rows of musketeers. Despite much practice at marching to form such elaborate formations as the so-called ‘Cross of Burgundy’ or ‘Eight-pointed Star’, it takes little imagination to realise that manoeuvring in such formations was virtually impossible. The idea of marching to a single beat of the drum had still to be widely introduced and cohesive movement was only possible by extended rank. Where Tilly proved so successful in organising infantry tactics, Wallenstein proved no less formidable in handling cavalry. Cavalry like infantry were divided into heavy and light. The heavy cavalry were cuirassiers and lancers, both armoured down to their boots. In addition to their main weapon, lancers were also armed with a sword and two pistols, symbols of their privileged status as bodyguards to the commanders in the field. The cuirassiers carried the heavy straight sabre or ‘pallasch’, which was designed to cut as well as thrust. The horsed ‘carabiniers’ were organised as light cavalry as their only armour was a metal helmet and a light breastplate. Equipped with a shorter musket and 18 cartridges, these horsemen also carried pistols and a short sword. The dragoons were also equipped with a short musket and were indeed originally horsed musketeers. As the barrels of their muskets were often decorated with a dragon, they became known as dragoons. Deployed as advance guard cavalry they carried an axe with which, in theory, they could batter down doors and gates. To these conventional groupings Wallenstein added new elements. An important part of the horsed advance guard was the ‘ungrischen Hussaren’, or Hungarian hussars. Together with the Croats they formed the irregular elements of the army who could be deployed to plunder and terrorise their opponents as well as perform scouting and reconnaissance. The origin of the term ‘hussar’ to this day is a source of debate. The word most likely stems from the Slavic Gursar or Gusar. Other theories link the word to the German Herumstreifender or Corsaren; this last with its imagery of piracy perhaps being nearer to the truth than many a Hungarian would care to admit. Famous for giving their enemies no quarter, they became the nucleus of what would become the finest light cavalry in the world. As with the infantry, the cavalry were grouped into companies. Often these were called Cornetten and hence the title of the junior officer of each such company was ‘Cornet’. As these were formed into a square, the custom arose to call four of these companies a ‘squadron’ from the Italian quadra, meaning square. In theory every cavalry regiment consisted of ten companies each of a hundred riders but in reality no cavalry regiment had more than 500 men. Drill of these formations was aimed at disordering infantry by charging the last 60 paces at the enemy’s pikemen or cavalry. There was to be no firing from the saddle until the cavalry could ‘see the white in the eye of the foe’ (‘Weiss im Aug des Feindt sehen thut’). Led by such Imperial officers as Gottfried Pappenheim, famous for his many wounds and refusal to be impressed by titles, or the redoubtable Johann Sporck, a giant of a man with hair like bronze, perhaps the most feared cavalry general of his time, the Imperial cavalry was trained in shock tactics relying on aggression and surprise to demoralise their opponents. The artillery remained a strict caste apart. Each unit of artillery was in theory organised to have 24 guns of different calibre. Mortars and other guns were added to each unit. Every gun had as its team a lieutenant and eleven gunners. These were supported by the so-called Schanzbauern or Pioneers, who were organised into units as large as 300 under an officer of the rank of Captain. The unit had its own flag made of silk which displayed as its badge a shovel and its men were also skilled carpenters able to strengthen bridges, not just demolish them.